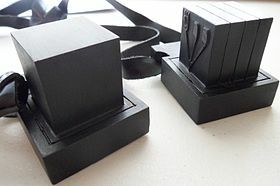 Tefillin (Israeli Ebreu: [tfiˈlin], תפילין), an aa cried phylacteries (frae Ancient Greek φυλακτήριον phylacterion, form o phylássein, φυλάσσειν meanin "tae gaird, pertect"), are a set o smaw black laither boxes conteenin scrowes o pairchment inscrived wi verses frae the Torah. Thay are worn bi observant adult Jews in weekday morn prayers; historically an tradeetionally, this is a male obligation, an sicweys, anerly males within Orthodox Judaism perform this mitzvah, or commandment. This page wis last eeditit on 20 Apryle 2018, at 06:21.